This article isn’t quite what I had intended to write earlier in the week. Initially, I had wanted to write about last night’s clash for the WBC 130lb championship that pitted the undefeated title-holder Francisco “Bandido” Vargas and the grizzled, battle-hardened Orlando “Siri” Salido. It was a match-up between two Mexican fighters with some measure of skill and an abundance of will; and I knew that all hell would break loose the moment one of them managed to land a good punch. It carried the promise of excitement and intensity, and it elicited a sense of anticipation in me that I hadn’t felt about a boxing match in quite some time. As it turned out, the fight delivered on that promise and provided fans with every single bit of action that we had hoped to see when this fight was made. After a feeling out process that lasted all of two minutes, the fighters got down to business and began to land heavy blows to the body and head. Time and again, the challenger would plough forward and land looping hooks to the body and then bounce right hands to the head. Time and again, Vargas would stand his ground and retaliate, raking his foe with his own selection of power-punches. Back and forth they went, trading momentum as frequently as they traded punches. Vargas rocked Salido badly in the sixth with a short right hand, but Siri weathered the onslaught and abused Bandido in the eighth. 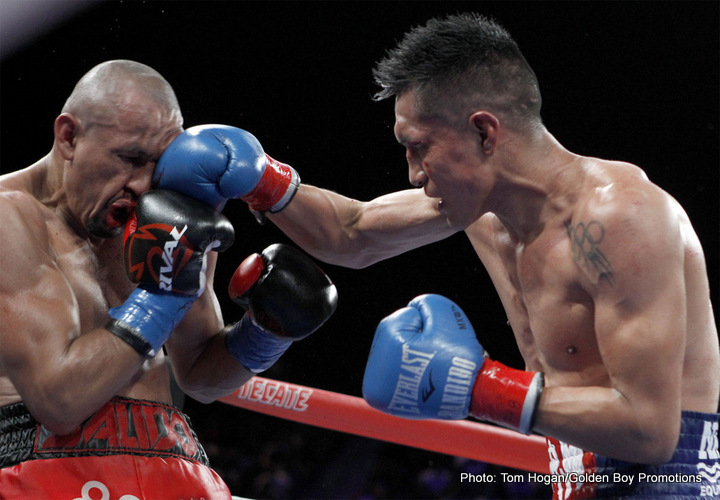 Undaunted, Vargas clearly won the tenth, only to have Salido storm back in twelfth using a mixture of borderline hooks, head-butts and the occasional legal punch to take the final frame. It was a brutal, breath-taking fight to watch, and the combatants were entirely deserving of the standing ovation awarded by the crowd at the StubHub Center. When all was said and done, there didn’t seem to be much to separate them; two of the judges agreed with that assessment and scored the contest 114-114 (the third scored it 115-113 for Vargas), resulting in a majority draw. Given the outcome, and the manner in which the action unfolded, we’re almost certain to see a rematch at some point in the near future. I should be thrilled about this, and overjoyed about the fact that this match-up was able to deliver as promised and produce one of the best fights of this or any other year. And, I am…But not for the reason that you might think. You see, Muhammad Ali died twenty four hours before this fight took place; and that was something that lingered in my mind as I watched Salido and Vargas go to war inside the ring. Ever since I found out about Ali’s death, I’ve been struggling to think of a way to pay tribute to him. I confess that I’ve had a difficult time with this, due to the fact that there’s just too much that I’d like to discuss. There were so many dimensions to him, not just as a boxer but as a human being. Where does one begin? What aspect of the man and his career would you like to focus upon once you start? These were the questions that were flashing through my mind when Vargas and Salido stepped inside the ring, and for a couple of rounds they remained with me. But, as the fight progressed, those questions began to fade, and I found it easier to focus on the battle being waged in the ring. Part of the reason for that was because the action taking place in the ring was so damned good, but another part was due to the realization that, in their own indirect fashion, these two fighters were producing a far more eloquent tribute to Ali than I could ever hope to write. That may seem like an incongruous statement, given that we’ll never, ever see the likes of Vargas and Salido attempt to float like a butterfly and sting like a bee. But while their respective boxing styles bear little resemblance to the one utilized by The Greatest, they are similar to him in another regard. …And, make no mistake, that’s a certainly statement that also applied to Ali. At his best, the three time world heavyweight champion was brilliant boxer who was blessed with otherworldly speed, timing and accuracy. But Ali was more than the sum total of those physical gifts. Even when time stripped him of those attributes, Ali remained one of the most dangerous men on the planet because at his core, he was a ferocious warrior with unbreakable will. Even when he was well past his best, he was still capable of finding definitive answers to difficult questions an opponent might pose to him. My favourite example occurred in September of 1977, against one of the hardest punchers in boxing’s history, Earnie Shavers. Shavers produced an aggressive, inspired performance against Ali and nearly knocked him out on a couple of different occasions. Still, Ali was able to out-box his slower opponent for long stretches and held a solid lead on the cards going into the fifteenth and final round. Had he been so inclined, Ali could have coasted in the final stanza and held on to secure a close but clear decision. Instead, he met Shavers head on, and somehow produced a volley of punches that had the challenger reeling and in full retreat as the final bell sounded. Ali was just about done at that point in his career, a shade of the boxer he’d once been. But, even then, he proved in that moment that he still possessed that unbreakable will. Even then, when well past his best, Ali proved he could still rumble. Last night, Francisco Vargas and Orlando Salido proved, in spite of all their previous battles, they could still rumble, too. They proved last night they were both fully capable of answering questions that the other might ask. And, I’d like to think that had Muhammad Ali gotten the chance to watch this fight take place, he would have appreciated what was taking place in the ring. I know I did. Right now, I’m grateful to Bandido and Siri for providing me with the inspiration to write a different sort of article than the one I had initially intended to write. And I’m already excited about the fact that they’re likely to step inside the ring once more. Because, when they do, I have a feeling that their next indirect tribute to The Greatest will be just as eloquent as the first one they produced.